The service proposal industry is full of different types of works and specializations. No wonder that the recent study of the industry that has the most number of employees are trained workers or what we call the labor pool. There are number of common labor jobs ranging from electricity to plumbing. However, one of the most notable jobs that I truly admire is landscaping. Imagine the labor plus creativity that you have to put in order to come up with a beautiful and magnificent landscape. The problem is that it is a growing industry and competition is rising so you have to devise a tool to stay on top. 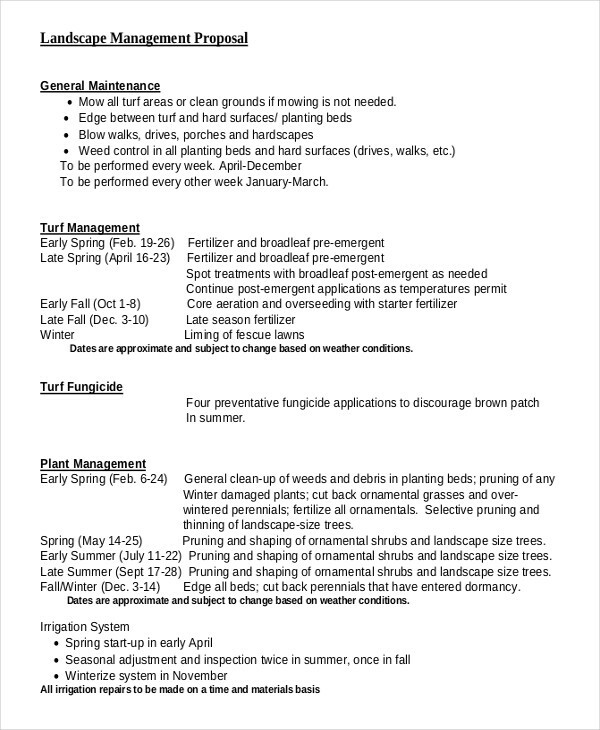 What Is a Landscaping Proposal? 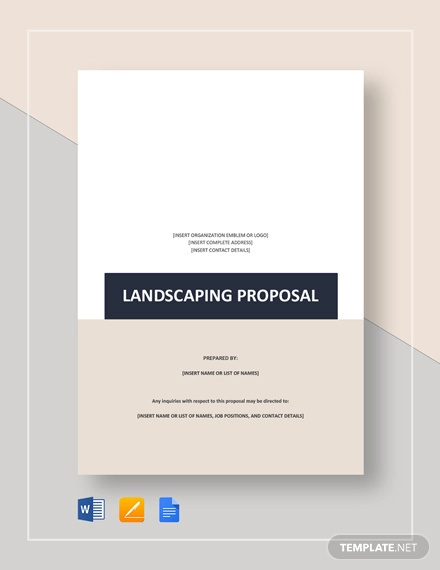 A landscaping proposal is a document that is drafted in order to provide a considerable amount of information that will be used to gain clients’ trust to accept a landscaping service. Landscaping is an in-demand job in urban areas specially in residential areas and villages. Landscaping is the process of developing a certain piece of land or space and make it into a picturesque view. It is a challenging job considering the amount of time that the project proposal demands as well as the resources. 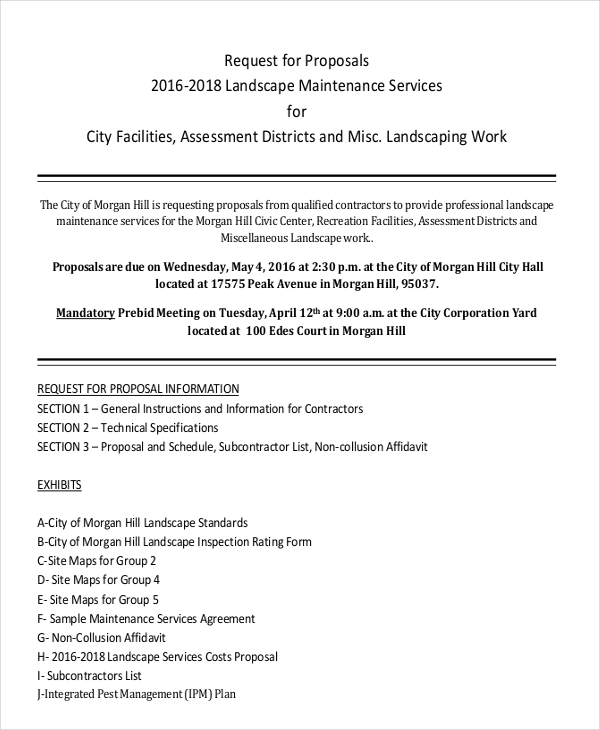 Another obstacle is the competition for the service, which the landscaping proposal can address when written effectively. 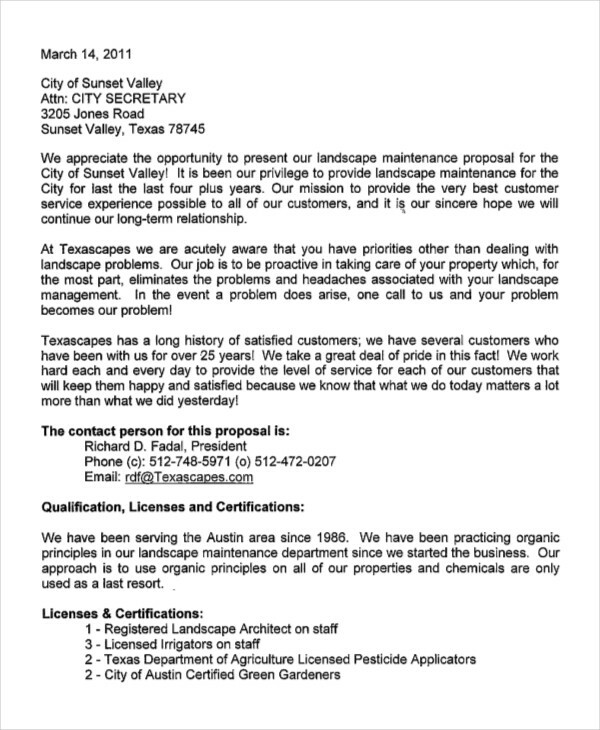 Landscaping proposal is but a segment of the many types of a proposal. The main objective of a proposal is to present a solution to a client’s problem and to gain their trust that you are the best person to provide that answer. 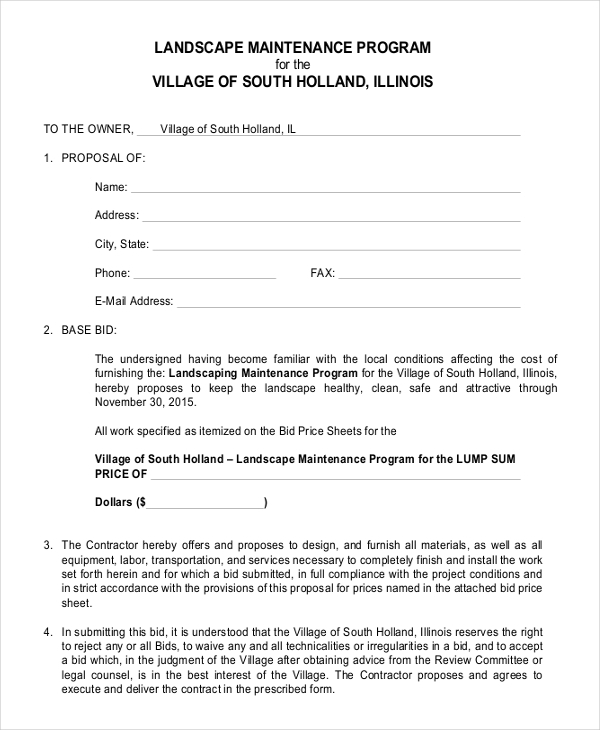 The purpose of a landscaping proposal is to make your self known to your client. Before a personal appearance to gain a business agreement, a proposal needs to be written. Your proposal will serve as your main tool to provide your client a reason to trust you and choose you from among the choices in the industry. 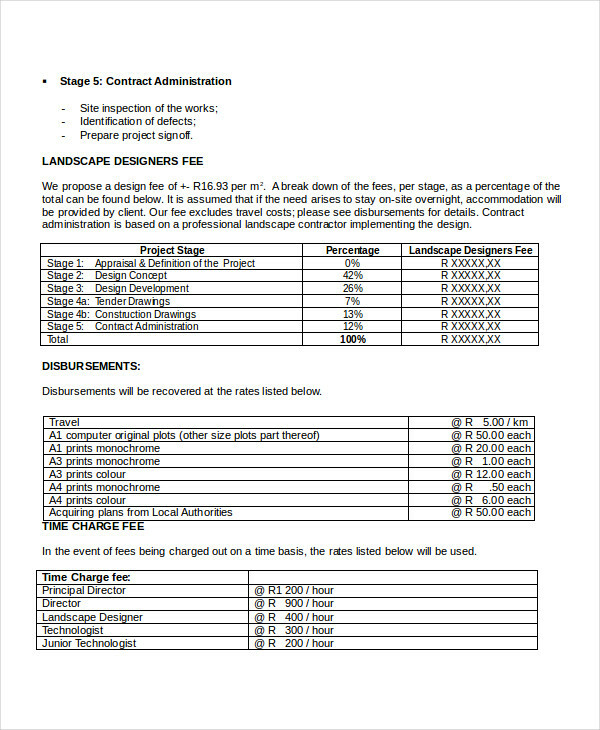 A landscaping proposal is just like any other proposal, except of course, for the content that should be included in it. The key to writing any proposal is to learn the basics of a simple proposal format. Indeed, your work will run smoothly when you have an outline that will serve as a guide as you write. Write an introduction. Your introduction should be contain words of gratitude for an opportunity to present a proposal. Remember that not everyone is given the chance to write one. Be sincere on the words that you write and use positive personal statements. State the need. 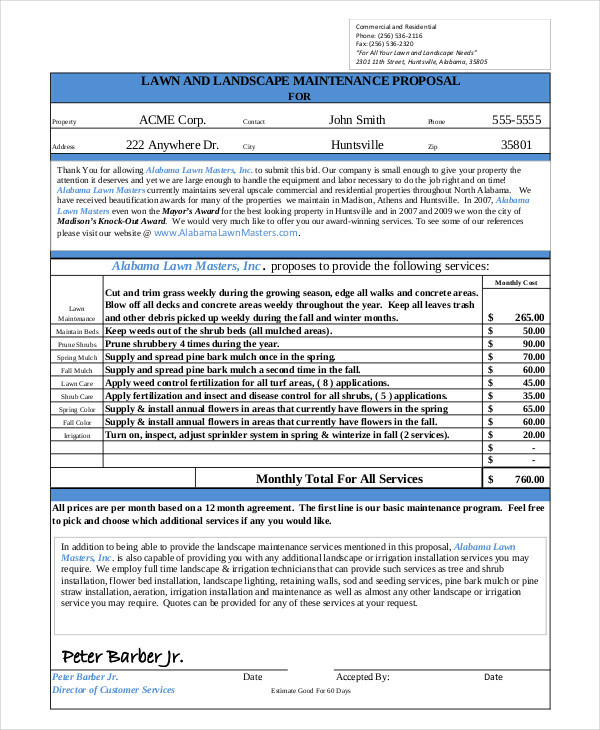 An important key to write an effective landscaping proposal is by identifying the needs of the client. Be specific with the details like the kind of area that needs to be worked on as well as the materials and equipment needed. The more you know about the needs, the better the impression you give to the client. Offer the benefits. This is the part where you have to explain what needs to be done and how efficient you are when it comes to this job. Site some projects you have worked on and how satisfied your clients. Offer the advantages and reasons why you are the best.